Next month, as the November issues of magazines start hitting newsstands, several of them will likely boast the faces of Barack Obama and John McCain (apparently there's some big news peg). But the one we'll be most interested in is Men's Health. Keith Kelly reports that their profile of the Democratic presidential candidate will include segments from an August interview, and images shot by the magazine's photographers. Sure, Men's Voguehas him on the cover of their October issue, shot by Annie Leibovitz, but do they talk about his infamous gym routine? Nope! And that's what we want to know. We're already aware that the Illinois senator records his careful workouts, and uses a combination of free-weights and machines. And we know that he may work out up to three times a day, without sweating. But does he eat oatmeal (with antioxidant-rich blueberries) every morning, and a slice of avocado and fourteen almonds at 11 a.m.? Does he have six different crunch routines for guaranteed rock-hard abs? 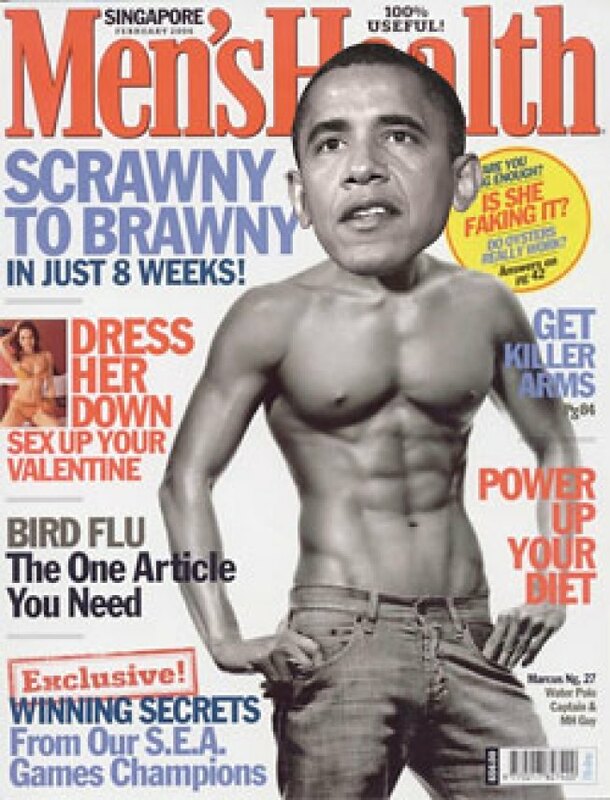 And most importantly, will he pose shirtless and dehydrated like every other good Men's Health cover model? He should. Because if he has anything McCain doesn't that can win over those stubborn Hillary voters, it's beefcake.